A Tier 1 Job Tax Credit Designation carries dramatic tax advantages. The eligible area (Opportunity Zone), qualifies for a State of Georgia maximum allowable job tax credit of $3500 per employee. Only 2 or more jobs need to be created to be eligible, the lowest job creation threshold of any job tax credit program. Use of Job Tax Credits against 100 percent of income tax liability and state payroll withholding. Expansion of the definition of "business enterprise" to include all businesses of any nature. New and Existing businesses creating new jobs are eligible. In December 2010, the City of Hapeville submitted an Application for Opportunity Zone Designation with the Department of Community Affairs. Local governments undertaking redevelopment and revitalization efforts in certain older commercial and industrial areas were eligible to apply for the designation. 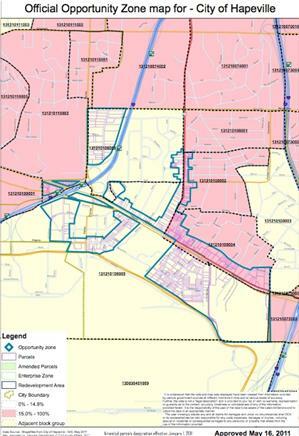 The DCA considers designations for areas that are within or adjacent to a census block group with 15% or greater poverty, where there is evidence of underused or vacant properties and other conditions exist, and where an urban redevelopment plan exists.